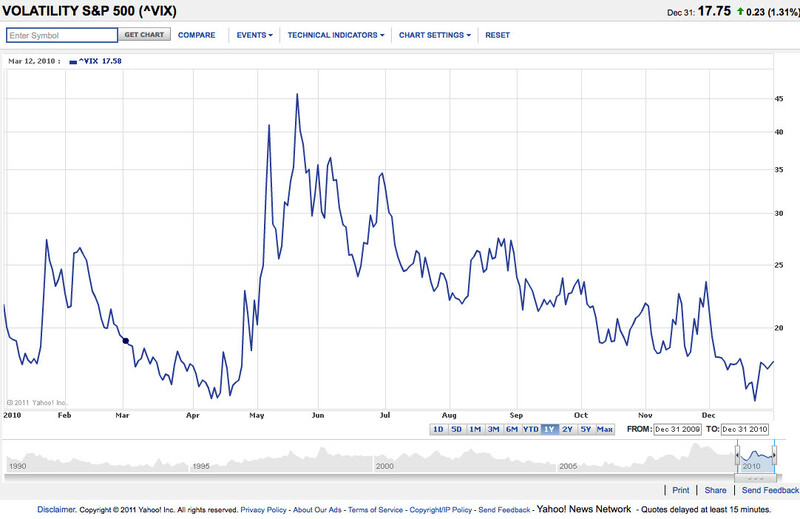 The Wall Street Journal had an article on risk control that had the attitude of “here are some silver bullets.” Ugh. When will journalists learn that there are no simple solutions to portfolio management? So long as there are few using the strategy, it may work well, but it will not scale because volatility does not match the proportion of assets available to be purchased. The same is true of “risk control” and “risk budgeting” strategies. They will be “flashes in the pan;” there is no necessary reason why they will work. There is no such thing as risk, but there are risks. Avoid faddish ideas as described in the WSJ article. Far better to focus on what risks you face in the investment markets, and choose assets that will not be affected by those risks,or, might even benefit from them. 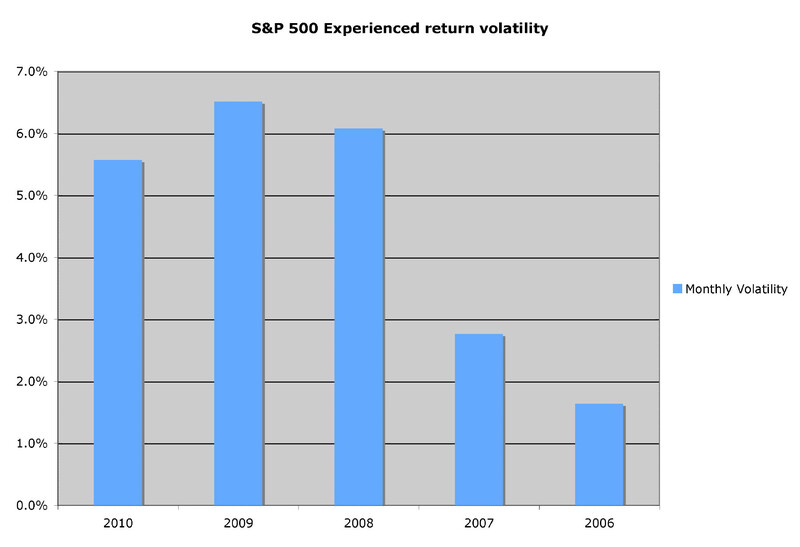 Using volatility as a guide to investing will fail if it gets large enough, and during bull markets, it will be forgotten. Non-scalable strategies work if there is a barrier to entry, and there is no barrier here. Thus I see no long term value in the strategies proposed. 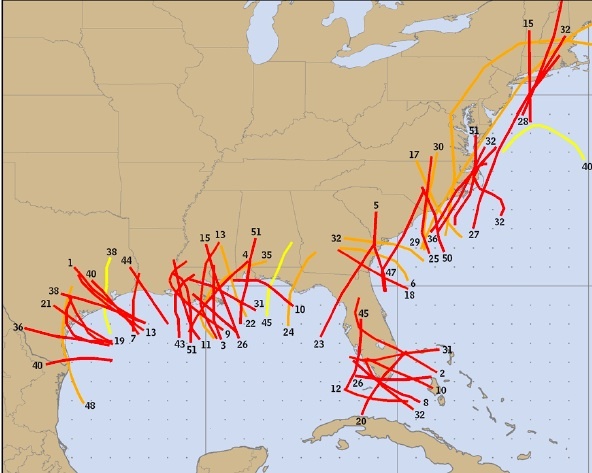 The lines on the graph represent the paths of the 50 most deadly US hurricanes on record. The numbers on the lines are the number of deaths. One important thing to notice is that there is nowhere on the eastern or southern coasts of the US coast that has not experienced deadly hurricanes. That suggests two strategies for dealing with hurricane risk for an individual. Avoiding it by moving well inside the lines. Building up a residential system that is resilient to the forces of hurricanes. The first strategy is suspect until you study the risks of those areas. The area just outside the lines includes the New Madrid fault and an area that has experienced major inland windstorms, hailstorms and floods in the recent past. So there is no guarantee of safety by risk avoidance. That leaves resilience as the best bet. Resilience will involve learning about safety measures, setting a risk tolerance and finding out how strong of a storm fits within the risk tolerance. In Japan, they set their risk tolerance to be that they would not accept a risk of a storm that is within the range of all past experience. They thought of that as a zero risk tolerance. They learned on 311 that their actual risk tolerance (storms within the historical observations) and their notional risk tolerance (zero) were not the same thing. For an insurer or a business, there are very different options. Diversification and insurance/reinsurance may be chosen instead of resiliency. A.M. Best added a Supplemental Rating Questionnaire (SRQ) for insurers at the end of 2010. While it will provide interesting information that will aid the analyst develop questions for a face-to-face meeting, the mainly checklist format will limit its value. A better option would be for a company to utilize this SRQ to develop an internal risk management report that could be presented to the board and external stakeholders much as insurers generate an investment management report. The A.M. Best checklist could be a by-product of this process. A.M. Best’s statement that “each company’s need for ERM is different” is absolutely correct. Organizations with complex and varied product mixes should spend their time understanding both the silo risks and the interactions between those silos. Going into 2006 insurers (and rating agencies) did not have leading indicators in place to monitor housing prices, yet that proved to be the driver leading to the financial crisis. There is little in this questionnaire that is forward looking toward new and emerging risks. The questionnaire does not do enough to focus on concentration of exposures. No credit is awarded for a diversified group of independent risks. There is also no mention of counterparty risk with reinsurers. The financial crisis left reinsurers ever more entangled, and if one ever experiences financial difficulties a contagion effect could drag quite a few down with them. If that happens there is no reason to think that insurers would not batten down the hatches as banks did with their loan portfolios. Insurers should have a contingency plan for this possibility, along with performing other stress tests and board discussions. The questionnaire refers to reporting risk metrics. This should be more specific. Financial statements do a pretty good job of reporting lagging indicators such as revenue and net income. 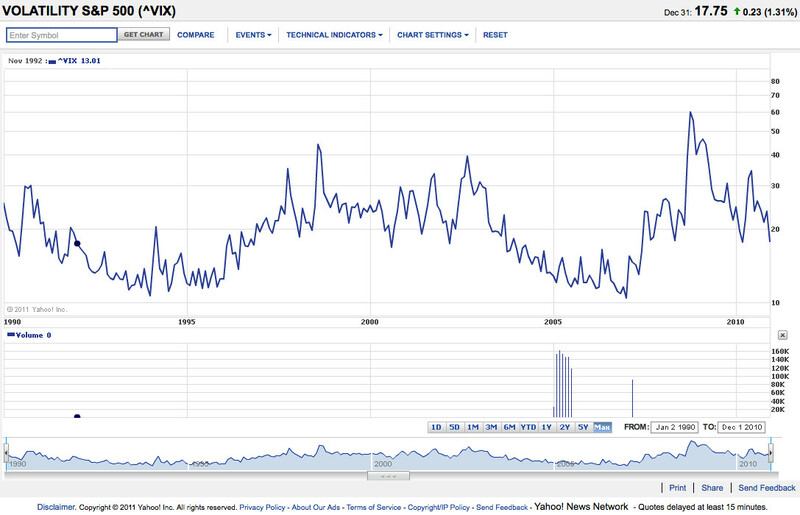 What would be more useful when managing risk are leading indicators. What metric can I look at today to anticipate future revenue? Keeping track of metrics such as agent retention, applications received, or unemployment will allow the line manager to better understand the business line and the risk manager to better identify potential risks. Today, many insurers are developing this process but it is still evolving. In the risk culture section of the questionnaire, terms such as risk/return measures and reporting risk jump out at me. Not all risks can be measured, and many can’t be measured accurately. That does not mean they can’t, and certainly does not mean they should not, be managed. Examples would include the likelihood and severity of civil unrest around the world. It is not important to judge precisely how likely these events might be, but it is important to think about how you might react if such an event does occur. Options are generally limited after an event occurs, and time is often the critical factor. Reporting risk means many things to many people. It would be preferred to have a dialogue about risks, using a written report as a starting point. In the Risk Identification/Measurement/Monitoring section of the questionnaire, A.M. Best asks “Who is the most responsible for identifying material risks to the company’s financial position?” This seems to be a no-win question, as no matter who is listed shortcomings will be associated with it. If you list the CEO, then the CRO is short-changed. If you list the CRO, the line managers wonder what their role is. Perhaps a better question would be to ask who is responsible for consolidating risks and looking at them holistically, scanning for emerging risks as well. It will be interesting to see what A.M. Best does with the table considering the largest potential threats to financial strength. There is no consistent approach to estimated potential impact. Two companies with the exact same exposure to a risk might report vastly different dollar figures. The higher number might be generated by the organization that better understands the risk. The most interesting question to me would be to ask how independent of results are the modelers? Who do they report to? How is their bonus determined? My perception is that there is subtle pressure put on modelers to hit certain results and that they should understand their models well enough to know which levers to pull that won’t raise a warning flag. At this point there is no audit requirement for an economic capital model. Missing in this questionnaire, as well as the NAIC’s Risk Focused Examinations, is a view of the future. In my opinion, if there is not an immediate solvency issue then the most interesting question is what could impair this organization in the future. For many insurance firms this will be related to selling profitable products and being flexible. It is hard to find distribution without giving away either options or returns. Consolidation in the insurance industry is likely. How many companies have considered their competitive position is their competitors merge? For distressed firms it is rarely a previously managed risk that takes them down. What environmental scanning is being done? What Risks are you Worried about Today? Risks that could be included in this type of analysis would be considered stress tests by many, but how many organizations would share more than they think their competitors are sharing? Here are some risks to ponder, along with their unintended consequences, in no order. A reinsurer becomes insolvent due to investment losses, stressing other reinsurers. A consolidator enters the industry, generating economies of scale that reduce potential returns by 2%. Infrastructure around the world ends its useful lifetime and is not replaced. Water wells are drilled in developed countries by farmers and local communities to access an aquifer. Warning: The information provided in this newsletter is the opinion of Max Rudolph and is provided for general information only. It should not be considered investment advice. Information from a variety of sources should be reviewed and considered before decisions are made by the individual investor. My opinions may have already changed, so you don’t want to rely on them. Good luck! Warning: The information provided in this newsletter is the opinion of Max Rudolph and is provided for general information only. It should not be considered investment advice. Information from a variety of sources should be reviewed and considered before decisions are made by the individual investor. My opinions may have already changed, so you don’t want to rely on them. Good luck!